Fresh from the pristine, icy waters of the Pacific Northwest, Wild Sockeye Salmon is a deep red color and chock full of true salmon flavor. Skinless and boneless fillets are hand packed and cooked just once to retain their nutritional potency and natural juices, rich with Omega 3 oils. 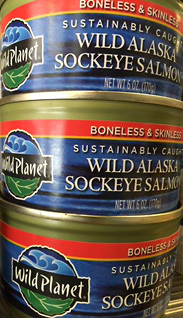 Sockeye Salmon are canned fresh upon catch, not from previously frozen fish – 6 oz can. Sold as an Add-On Only to Crab Packages! Item is not sold or shipped online separately. San Francisco’s Finest Sourdough – Package Add-On Only!